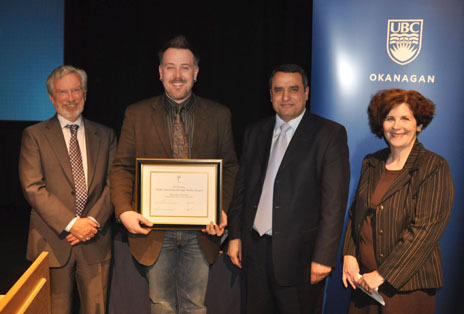 The Provost’s Award for Public Education Through Media recognized faculty members from UBC’s Okanagan campus who had demonstrated outstanding service to the University and the community by actively and creatively sharing research expertise via the news media. The award consisted of a research stipend of $2,000.00 and a certificate of award. Dr. Christopher Schneider received the 2009-2010 Provost’s Award for Public Education through Media at the annual Celebrate Research Week gala event. Bonnie Bates-Gibbs, Director of Alumni and University Relations presented the award, a $2,000 cash prize. “Not only has [Chris] been incredibly active in the news media, participating in numerous print, radio, and television interviews, but he has gone above and beyond to establish a community-accessible dialogue” said Bates-Gibbs. “He truly has taken his role as an educator beyond the classroom and into the community”. Dr. Kenneth Carlaw, Associate Professor of Economics and Dr. Mary Ann Murphy, Associate Professor of Sociology and Social Work were named co-recipients of the inaugural Provost’s Award for Public Education Through Media. “Dr. 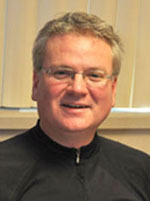 Carlaw has applied his research expertise in the field of economics to the global economic activities during the past year, sharing his expertise with a broad audience, via a variety of media sources,” said Bonnie Bates Gibbs, Director of Alumni and University Relations. 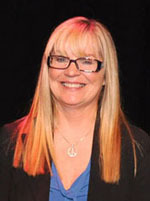 Murphy was recognized for applying her expertise on aging to issues of particular importance to the Okanagan region. “Dr. Murphy has connected with a broad audience through a variety of news sources, ensuring both access to information and a greater understanding of the issues at hand,” said Bates Gibbs.